Here's a sneak peek of a work in progress of another skyriter, the sibling to my green racer. All work has ceased until I have free time at a later date. Lucky, my L32 is also at a stand still til then. uuuurrr.... You're not Australian, are you? Thx, no not Aussie, why? Are they an Aussie rugby team color or something? I was just informed by a friend that green and gold are Aussie national colors (colours for them commonwealth type). I had no clue. I always thought national colors were based off national flags. Don't let them fall down the stairs! Fantastic! I must get a Skyriter. What a great colorful matched set! 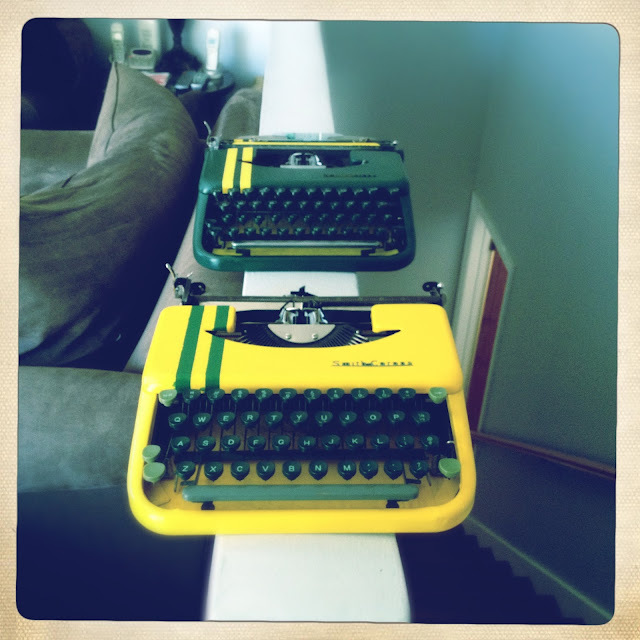 I've been tempted to paint an Olivetti "Dora" shell yellow. Right now it's a light gray -- very nondescript. Your typewriters really POP. Reminds me of a great song by H.P. Zinker: "Hovering"
I would like to see the WORK in progress like how did you tear them down and paint them and what you used and how you used it and everything in pictures. It seems everybody blogs about typewriters and tells the audience "look at what I've done" or are doing but never in any kind of process. Did you want to keep all that a secret. The machines look great I'd do it too!